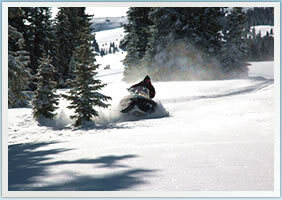 High Adventure Tours offer the most aggressive Guided Snowmobiling the Vail and Beaver Creek areas have to offer. Led by veteran guides, these tours offer ultra small group sizes and our most advanced snowmobile terrain. High Adventure Vail Snowmobiling Tours were created for riders seeking full-throttle access to the backcountry powder that's made Colorado famous. If you've been craving the ride of a lifetime amongst the Continental Divide's most awe-inspiring peaks, look no further - these Snowmobile Tours were created just for you. Featuring riding elevations over and above 12,500 feet, we promise there's no shortage of adrenaline to be had. High Adventure Vail Snowmobiling Tours feature an upgrade to Polaris 550 RMK snowmobiles, as well as full-face helmets, boots and snowsuits. These tours maintain the smallest group sizes of any of our rides, and focus on snowmobiling Colorado's most adventurous terrain. Previous snowmobile experience is recommended but not required. These tours do not allow for double riders due to the challenging nature of the terrain they access. 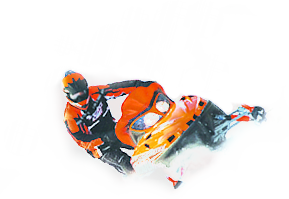 High Adventure Snowmobile Tours can be booked in lengths of two or three hours. Multiple departure times are available daily. Two-Hour Tours depart at 9:00 am, 11:00 am, 1:30 pm and 3:30 pm. Three-Hour Tours are offered at 9:00 am and 2:30 pm. Complimentary transportation is available on Two-Hour High Adventure Snowmobiling Tours beginning at 9:00 am, 11:00 am, 1:30 pm, and 3:30 pm. Guest pick-up in Vail is scheduled one hour prior to tour times, while pick-up in Avon and Beaver Creek is scheduled one hour and fifteen minutes prior to tour times. Guests must provide their own transportation on all Three-Hour Tours. Transportation is offered from the towns of Vail, Beaver Creek, Avon, Breckenridge, Keystone, Copper Mountain, Silverthorne & Dillon, Colorado. Please note that because transportation is offered from several locations, it is important we know which resort locale you are staying in. 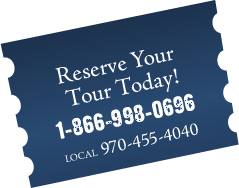 To book your High Adventure Vail & Beaver Creek Snowmobiling Expedition call us toll free at 1.866.998.0696 or locally at 970.455.4040. 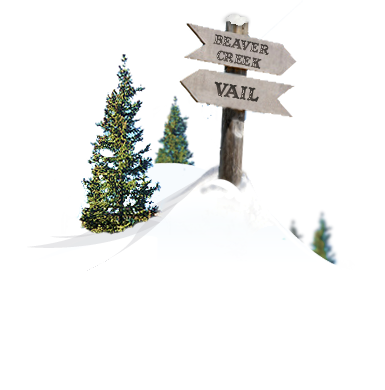 High Adventure Vail & Beaver Creek Snowmobiling Tours do not allow for double riders. Snowmobile drivers must be 16 years of age with a valid learner's permit. Because of the exclusive nature of High Adventure Tours, we recommend a guide gratuity of $40 on 2-Hour Tours and $60 on 3-Hour Tours.